The idea of committing each day’s events to a diary—or as Greg Heffley repeatedly reminds us in Diary of a Wimpy Kid, “it’s a journal”—feels a bit out of place in our fast-paced, social networking world. But that hasn’t stopped developers from thriving with apps like Day One ($30 on the Mac App Store), which succeeds at modernizing this once-popular ritual in digital form. Search the Mac App Store and you’ll find nearly 100 titles capable of collecting such memoirs. The latest is made by Chronos, a publisher best known for OS X productivity tools such as Greeting Card Shop, iScrapbook, and PrintLife, who has proven they have the programming chops to create good software. 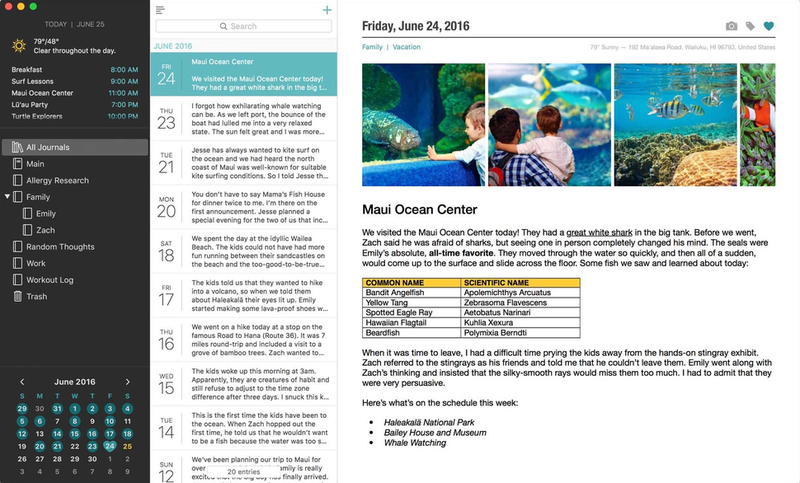 There’s a lot to like about Daylife, which features a slick user interface that makes it easy to keep a diary or journal of each day’s activities. 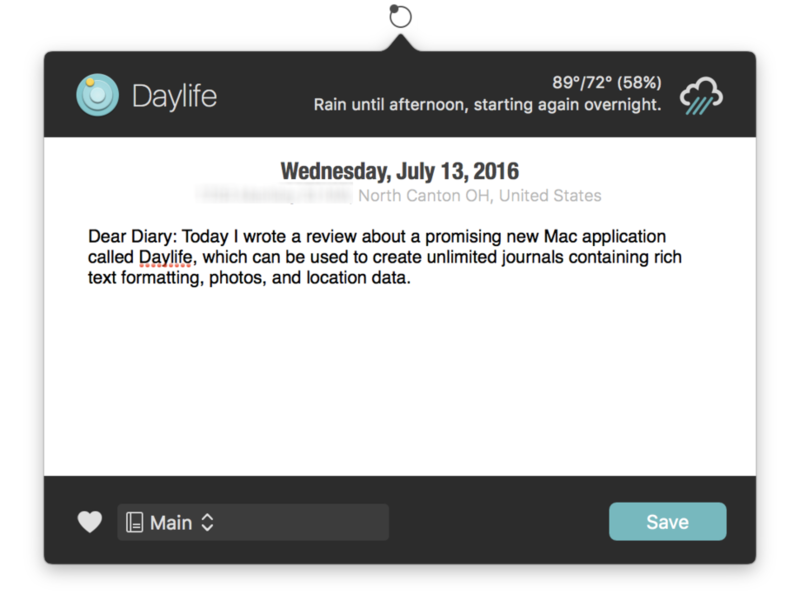 They’ve certainly done so again with Daylife ($40), but unlike the company’s previous creations that work great as self-contained applications, this one feels strangely disconnected from today’s mobile, socially-minded world. With all due respect to Mr. Heffley, Daylife is the digital equivalent of a diary used to record daily entries in for future rediscovery, which can be embellished with rich text formatting, photos, and location data. Like other Chronos software, Daylife offers a polished user interface that’s slick and easy to use. 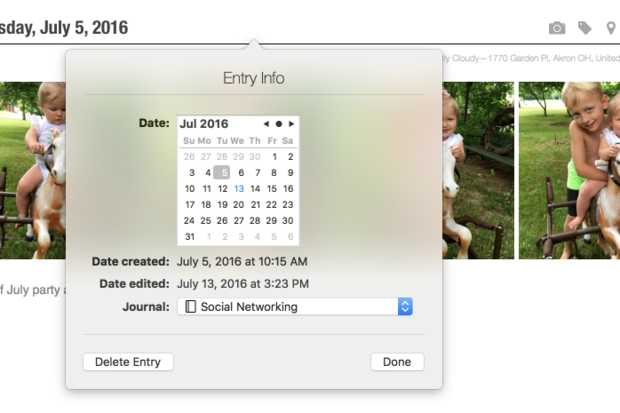 You don’t even have to open Daylife to make an entry—just start typing in the quick entry window from the menu bar. It’s also eerily reminiscent of Day One, my current go-to journaling software. The window is split across three panes, with weather and calendar dashboards above the list of journals on a dark sidebar along the left edge and a list of entries at center; the currently selected entry takes up the remainder of the space. While the basic premise is similar, I prefer some of Daylife’s UI choices, including the sidebar (which can also be used to stack journals into subcategories) and the bolder, cleaner look of entry headers, which display the date along with buttons for importing photos, adding tags or location, and marking favorites. Both apps offer a background helper accessible from the menu bar. It’s a fast, easy way to add new entries, although Day One has the upper hand with its ability to also tag entries from the same place. The tables turn back in Daylife’s favor when it comes to the number of journals you can create, and how many photos can be added to each one. Day One imposes a strict maximum of 10 in both cases, while Daylife allows an unlimited number of each. You can change the date and location of existing entries, but there’s no way to manually override the time when it was created or edited. Daylife is also better at displaying multiple images as square thumbnails in a scrolling horizontal grid for a cleaner layout, but you’re out of luck if you want to take a closer look—there’s no way to Quick Look or view images larger. The app also can’t add or edit the entry time, and ignores GPS information embedded with imported photos, instead geotagging the current location of your computer. In the latest update, the location can be manually updated on a per-entry basis from a searchable map. Daylife is also largely an island unto itself. Users can import or export text data, but there’s no way to share entries other than to print or save as PDF files, which omit images and maps. Although real-world diaries tend to be private, the fun of having a digital version is the ability to selectively share entries, something you can’t do here. Since there’s no cloud sync or mobile connectivity, Daylife is great for privacy, and all journals are protected with AES-256 encryption. 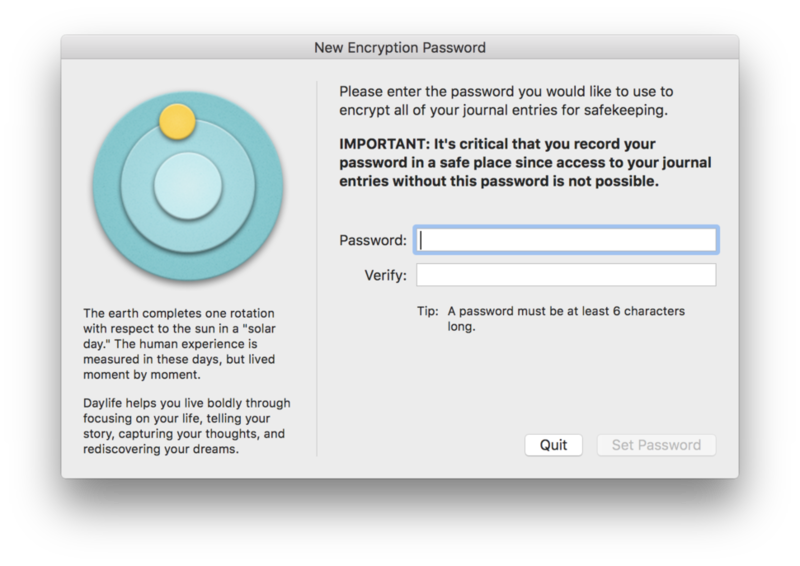 On the plus side, Daylife is well-suited to privacy advocates, because journal entries are secured with AES-256 encryption. Chronos is pushing out frequent updates, so I’m hopeful there will be improvements on some of my concerns. In the meantime, there’s a 30-day trial version available from the company’s website, so I’d recommend giving it a spin before committing to purchase. Daylife has a lot of potential with a great look and feel, but is quite limited in its present form compared to rivals like Day One.